"Studying art taught me to think visually and critically through problem solving and innovation. It taught me the power of making something out of nothing." Megan Lotts can remember the first time she felt like an artist. "As an undergrad, I would be in the studio all hours of the night, drinking coffee at 2:00 a.m., surrounded by other students," she remembers. That close-knit creative community helped cultivate her identity as a visual artist. "We would bounce ideas off of each other, brainstorm together," she says. "That kind of community is something special. I formed bonds with people I'm still close to today." In those early undergraduate years studying painting and art history, she was "the art student with a hard hat," she recalls, seeking out discarded materials to refashion into something new. A self-described conceptual artist, she prizes found treasures and unusual tools for making art. "Junk is possibility," she adds with a laugh. Today Lotts is tapping into that creative resourcefulness as an arts librarian in the Rutgers University Art Library. 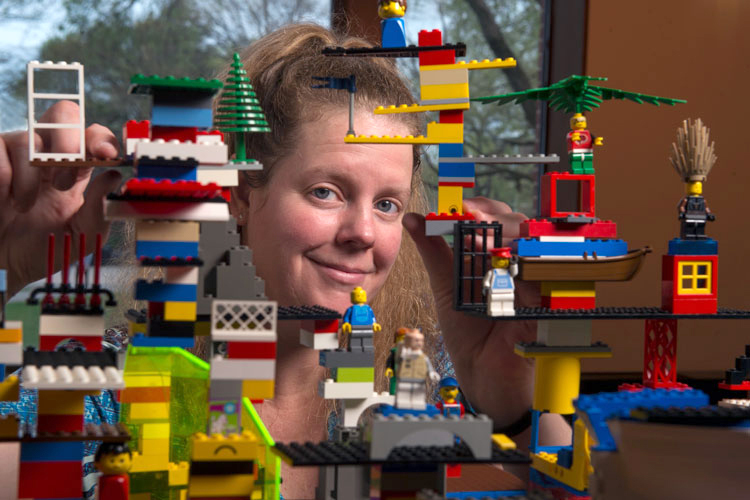 In addition to her teaching and library duties, she runs a popular Lego makerspace—a role that has earned her the nickname "Lego Librarian." Lotts was initially inspired to create the station after attending a conference overseas. On the first day, she was invited to participate in a Lego workshop. "Hours later I found myself working with people from 25 other countries solving problems in the library at the Lego station." Upon her return to Rutgers, she started collecting for her own makerspace with the assistance of a commercial junk removal company that rescued over 150 pounds of Legos from trash dumpsters. Rutgers alumni and library staff donated another 125 pounds. Visitors can interact freely with the Lego station and build as they please, but Lotts also offers structured workshops for groups that want to work on collaboration and problem-solving skills. As an educator, Lotts is passionate about studying the impact of play on learning. She recently partnered with a faculty member in landscape architecture on a freshman course about public spaces. Students were asked to visit buildings on the Rutgers campus (including the art library) to study who was using the space and how. For their final project, students used the art library's Lego station to create a model reflecting their experiences and wrote an accompanying paper. In addition to providing a tactile way for students to interpret the assignment, the station fostered a connection to the library itself. Lotts noticed that student visits to the library increased, and more people were contacting her during her office hours. "Art students often miss how much richer their career can be if they use a library," she says. Lotts sees play and hands-on interaction as integral to learning, but those don't have to come from a duplicate of the Lego station. "The Legos are just the medium," she explains. "It's how they evoke storytelling, and how you work with your hands to get into a creative mind space, that matters." Lotts first worked at a library as a clerk during her undergraduate career. When she began graduate art studies at the University of Wisconsin, she got a job at its library's audiovisual desk. It was there—working as a resource to lend laptops, equipment, and cameras—that her notion of a library's role broadened. "I began to see that libraries can be a collection of 'stuff,' not just books and journals," she explains. After finishing an MFA, she decided to pursue a library science degree. Her dual backgrounds in art and library science made her a natural fit for the Rutgers University Art Library position. "I can work well with artists because I know their language," she notes. Lotts remains grateful for the foundational skills she developed in her undergraduate career at Illinois. "As a student, you experience pouring your blood, sweat, and tears into a piece and then having that work critiqued," she says. "You learn to think critically about your own work and how to defend and explain it. Being able to communicate about your work is an essential skill."